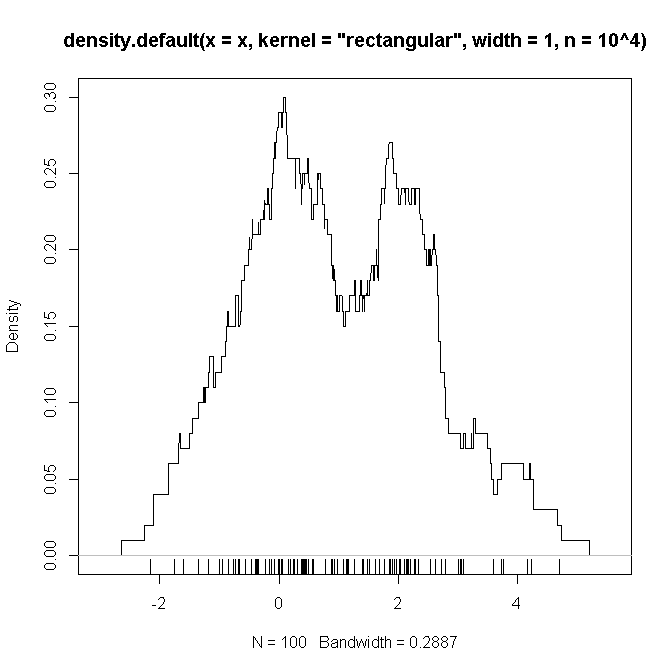 “Kernel density estimation” is a convolution of what? I am trying to get a better understanding of kernel density estimation. Let's take $K()$ to be a rectangular function which gives $1$ if $x$ is between $-0.5$ and $0.5$ and $0$ otherwise, and $h$ (window size) to be 1. I understand that the density is a convolution of two functions, but I am not sure I know how to define these two functions. One of them should (probably) be a function of the data which, for every point in R, tells us how many data points we have in that location (mostly $0$). And the other function should probably be some modification of the kernel function, combined with the window size. But I am not sure how to define it. Bellow is an example R code which (I suspect) replicates the settings I defined above (with a mixture of two Gaussians and $n=100$), on which I hope to see a "proof" that the functions to be convoluted are as we suspect. Corresponding to any batch of data $X = (x_1, x_2, \ldots, x_n)$ is its "empirical density function"
Letting $k(x) = K_h(-x)$ (which is the same as $K_h(x)$ for symmetric kernels--and most kernels are symmetric) we obtain the claimed result: the Wikipedia formula is a convolution. Not the answer you're looking for? Browse other questions tagged r kernel-smoothing convolution or ask your own question. Can MCMC iterations after burn in be used for density estimation? Which kernel function for Watson Nadaraya classifier? Can you explain Parzen window (kernel) density estimation in layman's terms? Are vanishing bias and variance enough for pointwise consistency for KDE-based estimation?